Cooking enthusiasts are often looking for simple ways to step up their game both taste and looks-wise. Even if you are not a huge cooking fanatic, jazzing up a meal every now and then is a good way to maintain a lively household. 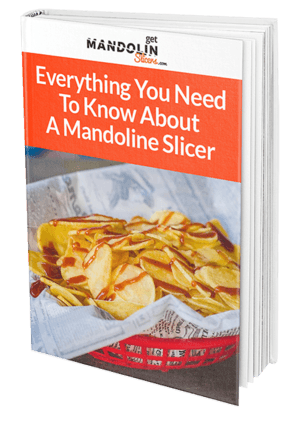 Mandoline slicers are one of the best kitchen appliances that can help increase the quality of your food and add that special touch that characterizes restaurant-quality meals at the same time. 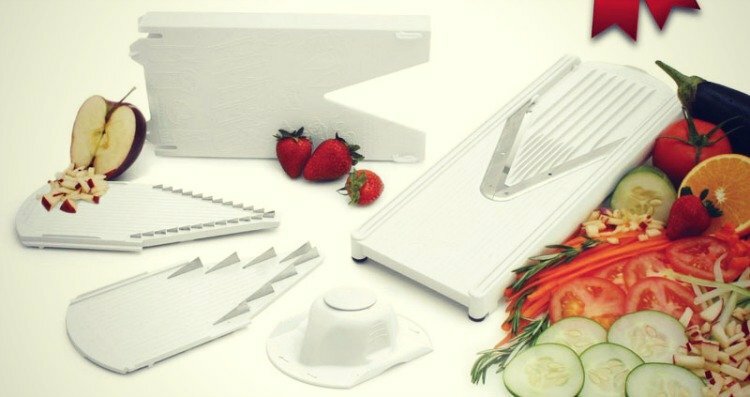 The Swissmar Borner V-1001 V-Slicer Plus Mandoline 5 Piece Set is one of the best in its class, and it offers a huge array of features that make it an all-around winner. Not only does it feature a versatile design, but this slicer is manufactured using surgical-grade steel and sturdy plastic. This means that the Swissmar Borner will have an outstanding performance every single time you use it. 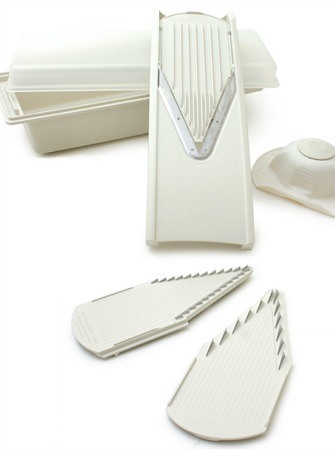 As if performance and durability weren’t enough, this mandoline is equipped with various accessories that allow you to adjust its functionality and to store it easily. 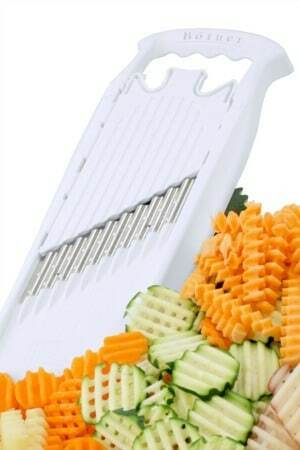 This makes the Swissmar Borner Mandoline Slicer a superb choice for homes of all sizes. The Borner line has been running for more than 60 years and they have been developing high-quality kitchen accessories since the 1950s. The V-Slicer Plus is a testament to their quality and durability as it’s known for being one of the best mandolines available today. This innovative slicer is made of high-quality stainless steel and BPA-free plastic. Its design allows you to change blade inserts, and it comes equipped with four different options from the package. The instruction manual includes all details on how to work all features properly. You can add and remove inserts to change the thickness of your cut, allowing you to select between slicing and julienning. The hand guard adds a nice safety precaution that prevents any possible accidents or injuries, completely guarding your fingers for a safer experience. As for storage, the Swissmar Borner can be flat-packed for easy storage and transportation. It includes an insert holder to house the additional blades and a locking clip for secure storage. The foldable legs prop up the mandoline to a usable angle, and the slip-proof rubber covers prevent it from moving when in use. 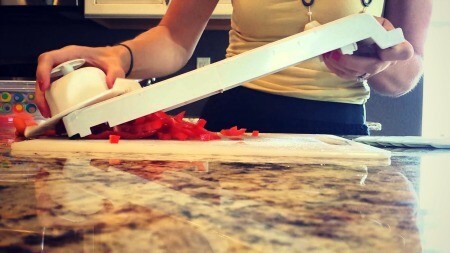 This slicer also features a neutral, ambidextrous design that makes it perfect for all people. Because it’s manufactured in Germany, this mandoline adheres to the highest quality standard, using surgical-grade steel to make the blades. These razor-sharp blades ready to use straight out of the box and are positioned at the perfect angle. The ergonomic hand guard lets you operate the Swissmar Borner comfortably and safely, while its versatile design lets you dice, shred, slice, julienne, chop, and much more. The food holder sits beneath the blades, so you won’t have to find a special plate either. Although they are mainly used for vegetables and fruits, these versatile appliances can be used to cut cheeses, roots, and cold meats as well. It can help you cook complex dishes and bakes evenly, increasing flavor and cooking time while at it. The main problem with appliances that can be used with several ingredients is that they get very dirty. However, the Swissmar offers a great option that is easy to clean and dishwasher-friendly, so you can clean it with the rest of your dishes. The Swissmar Borner Mandoline Slicer also adds a touch of beauty to your meals by evenly cutting all the ingredients, ultimately helping your presentation. You can also achieve different textures and shapes, giving your food that special look that is traditional of a great meal. Besides being incredibly functional and versatile, the V-Slicer Plus doesn't take up a lot of counter space even when expanded. You can choose to leave it out and give your kitchen a modern look or fold it up and easily store it out of sight. 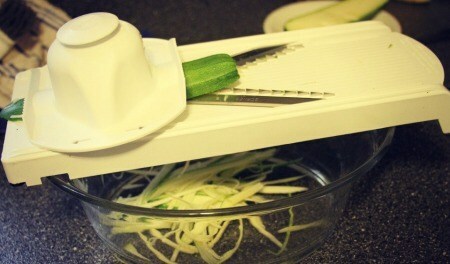 There are numerous online reviews praising the V-Slicer Plus because it’s a powerful and lean mandoline. Many reviewers bragged about the various recipes that they prepared using this slicer and repeated how quickly and effortlessly it sliced through ingredients. Others also highlighted the fact that the thickness adjustment mechanism was fast and easy to use, allowing you to select from different settings quickly. Another great aspect is that the Swissmar Borner was designed with safety in mind, so you don’t even have to touch the blade when changing inserts. The V-Slicer Plus also received many compliments because it’s small, takes up very little counter space, and can be folded and stowed away with much ease. It’s dishwasher safe, and requires minimal disassembly for you to place it with the rest of your dishes. Lastly, a stunning most of reviewers gave this slicer a great review, with several users claiming that they loved the durability of the plastic frame and the blades. They said that the blades were showing no signs of getting dull even after months of usage! Even though most of the reviews said nothing but great things about the V-Slicer Plus, there were some negative experiences being shared as well. Some claimed that their units showed up incomplete, missing the rubber feet and other essential parts. Others also said that it the plastic was flimsy and that it’s not suitable for larger meals. Additional to this, other customers also said that their model showed up with dull blades and that it was not sharpened prior to being sent to them. Lastly, a few other users complained about the fact that certain vegetables, such as turmeric, can stain the plastic and permanently discolor it. This, however, did not affect its functionality whatsoever. The best place to purchase our V-Slicer Plus is through Amazon because they offer the most competitive price starting at just under $55. This also includes free shipping, so you can have it delivered straight to your doorstep or office. With a relatively low price tag and additional attachments included in the package, the Swissmar Borner Slicer offers a great choice for all homes. With surgical-grade steel blades and various safety features, it has earned our stamp of approval as one of the best in its class.